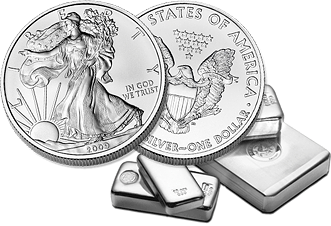 For those buying silver online, the United States Mint, Royal Canadian Mint, and the Perth Mint of Australia are often the first places investors look to find beautiful, reliable sources of silver coins and bars. Look a little further out into the South Pacific Ocean, and you’ll find that the island nation of Fiji lends its name to a great deal of impressive silver coinage. From the first major coin series from the islands, the Fiji Taku, to the latest in graphic-novel themed coinage, Fiji has put itself on the map with the help of various private mints in rolling out silver coins for sale. Silver.com is proud to carry some of the most impressive silver specimens from Fiji, and you can learn all about them below. Numismatists with a keen eye are well aware that the Fiji Taku coin isn’t gone from the modern market, it just exists under a different name and nation of issue. 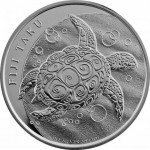 The Silver Niue Hawksbill coin, available since 2014, is the direct continuation of the Silver Fiji Taku series that debuted courtesy of the New Zealand Mint in 2010. The reverse design field of the coin carried over from the Fiji Taku to the Niue Hawksbill. The major differences in the coin pre- and post-Fijian issue come down to engravings and nation of issue. Today, the Niue Hawksbill coin has the same turtle design on the reverse that the original Fiji Taku had, but the sliver of open space on this side that reads “Turtle” as the Niue Hawksbill coin originally featured the engraving “Fiji Taku.” Taku is the name of the hawksbill turtle species in the local Fijian dialect. Silver Fiji Taku coins were issued starting in 2010 with very limited mintage ranges, and the coin was only available in the 1 oz silver weight. The coins had a face value of 2 Dollars and a beautiful reverse design that captured the Taku as it swam through the bubbly, shallow waters off the Fijian coast in the South Pacific Ocean. The Taku, or hawksbill turtle, is an aquatic turtle species found throughout the tropical waters of the Atlantic, Indian, and Pacific Oceans. In this particular region of the world, the Taku makes an annual passage from the islands of Fiji to the coast of the North Island of New Zealand to lay its eggs each year during breeding season. It is distinctive for its sharp, hooked beak (giving it the name hawksbill) and the overlapping, colorful shells on its back. On the obverse of the Silver Fiji Taku, there were two different designs in use. From 2010 to 2012, the coins had the right-profile portrait of Queen Elizabeth II. In this case, it was the third-generation depiction of the Queen created in 1984 by Raphael Maklouf, which included more ornate décor on Her Majesty from her higher crown to the necklace around her neck. With the issue of the 2013 Silver Fiji Taku, the last year of availability, the obverse design was changed to feature the coat of arms for Fiji. This symbol includes the national crest with two Fijians on either side, and a sailing vessel above that provides a nod to the nation’s seafaring history. The change in the obverse design in the final year is said to have stemmed for long simmering tension on the Fijian islands toward the commonwealth. In 2006 there was a military coup that threw the nation into chaos for several years from a governmental standpoint. The nation’s high court ruled the military leadership unlawful, but the president the military installed as the nominal head of state arrogated the Constitution and reappointed the military leader. After years of delays, there were finally democratic elections in September 2014. By this point though, the Silver Fiji taku had been cancelled and re-issued as the Silver Niue Hawksbill. The switch in 2013 to the Fijian crest and eventually cancellation of the coin as a Fijian issue likely stemmed from the political upheaval. All remaining Silver Fiji Taku coins available from Silver.com have 1 oz of .999 fine silver content, a face value of 2 Dollars, and arrive in BU condition. Coins in BU condition exhibit no signs of wear and tear, though you may notice minor flaws including breaks in the luster, spotted surfaces, and contact marks from coining. Recent years have seen a return to issue of Fiji coins. Among the most popular were a variety of graphic-novel themed coins issued as colorized proofs. All of these particular coins came from Sunshine Minting. Located in Coeur d’Alene, Idaho, Sunshine Minting is one of the largest private minting operations in the United States, with additional locations in Las Vegas, Nevada and Shanghai, China. 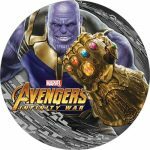 First up in the list are two anniversary coins celebrating two of the most significant superheroes known to fans of comic books. 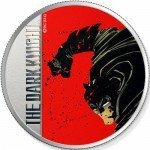 The 2016 2 oz Silver Fiji 30th Anniversary Dark Knight Returns Coin offers one of the more unique looks at Batman that the world has ever seen. The coin was struck in 2016 to mark the 30th anniversary of the 1986 release of Frank Miller’s depiction of the Dark Knight in a four-comic mini-series. The use of the term Dark Knight and the imagery of Batman in this series led to a rise in superheroes depicted as conflicted individuals. On the obverse of the coin is a colorized vision of Miller’s Dark Knight. It includes a red backdrop with hints of black, and of course the Caped Crusader is captured in his trademarked all-black outfit. The coins ship inside of Batman-themed boxes and include a Certificate of Authenticity. The mintage cap for this offering was a scant 3,000 coins. The 2016 issue of comic-themed silver coins included an even more significant milestone, that of the 75th anniversary of Captain America. The 2016 2 oz Silver Fiji 75th Anniversary Captain America Shield Coin is a stunning colorized piece with an obverse design that accurately reflects the popular shield of Captain America. A star in the center is surrounded immediately by blue, with red and silver rings emanating outward. These coins had a higher mintage cap of 7,500 (in honor of the 75th anniversary) and shipped inside of black display boxes that included color artwork and a Certificate of Authenticity. Finally, 2016 included a massive six-coin series from Sunshine Minting that focused on the feature film Captain America: Civil War. The film hit theaters in the spring of 2016 and immediately became a box office hit. Pitting the forces of Captain America against Tony Stark, aka Iron Man, the six coin series accurately depicted in colorized designs the major superheroes featured in the film. The six coin release included four individual coins as well as a 2 oz, separable coin of Captain America and Iron Man for the final release. Each coin in the series was available individually inside of a plastic capsule set in a collectible tin with Certificate of Authenticity. Individual design releases had a mintage cap of 3,000 coins. You could also purchase the entire set from the Captain America: Civil War colorized series in a lunchbox style tin that included a Certificate of Authenticity for the set as a whole, and each individual coin inside was sealed in its own collectible tin. Both the tins and lunchbox had full-color artwork from the film. Winter Solider: The 2016 1 oz. 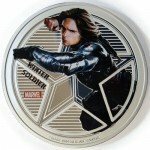 Silver Proof Fiji Captain America: Civil War Winter Soldier Coin that design features the Winter Soldier, a former ally of Steve Rogers who was lost behind enemy lines during the war and recruited by the Soviet Union. Black Panther: The 2016 1 oz. Silver Proof Fiji Captain America: Black Panther coin is the full, colorized image of Black Panther from the feature film. Engravings include the Marvel logo and Black Panther’s name. Silver Falcon: The 2016 1 oz. 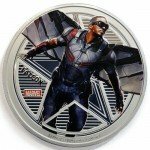 Silver Proof Fiji Captain America: Civil War Silver Falcon coin has an image of Silver Falcon, direct from the feature film, in full color. Engravings include the coin’s weight, purity, and metal content, the Marvel Comics logo, and the name of Silver Falcon. Black Widow: The 2016 1 oz. Silver Proof Fiji Captain America: Civil War Black Widow coin is the image of Black Widow, who is a master assassin and skilled in hand-to-hand combat. Engravings include her character name and the Marvel Comics logo. Captain America v. Iron Man: The 2016 2 oz. 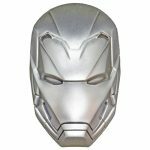 Silver Proof Fiji Captain America vs. Iron Man Coin looks like your typical coin at first, with a standard shape and design. In reality, it has a cracked division line down the center that actually lets you separate the coin into individual one ounce coins, each with a face value of One Dollar. On the obverse of the coins is the image of Captain America on one side of the design, and Iron Man on the other. The imagery comes directly from the feature film Captain America: Civil War. All of the coins in the comic-themed range from Sunshine Minting had the same reverse design. The Fijian coat of arms was depicted on the reverse, along with the nation of issue and face value of the coins. Like many other nations around the world, Fiji has its own Lunar Calendar-inspired series of silver coins. For this release, the coin collection has beautiful freshwater pearls set inside of the center design on the reverse side of the coin. 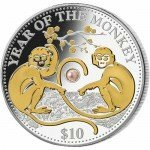 The most recent releases in this range include the 2016 1 oz Proof Silver Fiji Pearl Monkey coin for the Year of the Monkey, and the 2017 1 oz Proof Silver Fiji Pearl Rooster Coin for the Year of the Rooster. On the reverse of the 2016 1 oz Proof Silver Fiji Pearl Monkey Coin you’ll find the image of two monkey seated on the branch of a tree. The freshwater pearl is set in the center of the design between the two creatures, and for added brilliance there is a layered application of 24-karat gold on the monkeys. The obverse of the coins features the image of the Fijian crest, with an added detail that lends visual brilliance. Around the crest you’ll find a circular calendar that features inlaid design of all 12 animals on the Chinese Lunar Calendar, known as the Zodiac. 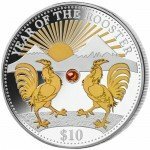 For the 2017 1 oz Proof Silver Fiji Pearl Rooster Coin you’ll find the same obverse design elements, and a similar reverse. The pearl is featured again in the center of the design, and there are two roosters on either side with a snow-capped mountain in the background. The roosters, like the monkeys, have a 24-karat gilded gold finish applied. Both coins ship in red, lunar-themed boxes and have a maximum mintage of 8,888 coins. The Proof Silver Fijian Lunar Series was launched in 2011. Known as the Great Wave off Kanagawa, this woodblock print has made its way onto a beautiful silver coin for the nation of Fiji. The South Pacific is no stranger to tsunamis and rogue waves, often created as a result of powerful underwater earthquakes that create massive offsets in the surface level water. The Wave, as it is known more simply, was created by the Japanese ukiyo-e artist Hokusai and published between 1829 and 1833 in Japan during the late Edo period. It was the first of a series of prints from Hokusai that were entitled “Thirty-six views of Mount Fuji,” as the prominent Japanese peak featured in all of the artworks. The 2017 1 oz Proof Silver Hokusai Wave Coins were struck in proof-like finish and colorized. 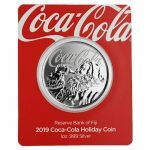 The 2017 Proof Silver Colorized Fiji Great Wave Coin shipped in a box with a Certificate of Authenticity and had a mintage limit of 2,500 coins. The obverse features the white-capped ocean waves as the tsunami’s force pushes across the ocean. The proof-like version of the coin had the same designs with a mirrored, proof-like finish. 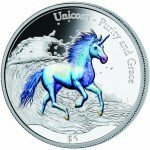 2016 3 oz Colorized Unicorn: The obverse has the image of a Unicorn featured. These mythical beasts were horses with a single horn atop their head, and are said to represent Purity and Grace, a phrase which is engraved on the obverse side. Like many other Fijian coins, the reverse of all these specimens include the Fijian coat of arms design, and that applies to the Great Wave coins as well. Silver.com makes it easy for you to receive your products without paying too much in shipping. Our affordable shipping rates are tiered based upon your overall purchase price, with any transaction in excess of $3,000 qualifying for both free shipping and insurance. All products are shipped in discreet packaging courtesy of the US Postal Service or UPS. Your order is fulfilled and shipped by Silver.com once your payment has been processed. PayPal and bank wire transactions process the fastest, with immediate processing possible. Credit/debit card transactions typically take one business day, while paper check payments take 4 to 6 business days. Bank wire and paper check payments are also eligible for a 4% discount on the purchase price. If your products are lost or damaged during shipping, we will work with your carrier to recover your shipment. In the event that is not possible, we’ll assist you in filing an insurance claim to replace your products or refund your money. 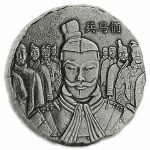 Silver.com welcomes your inquiries about Silver Fijian Coins. Feel free to call us at 888-989-7223, connect with us online via our live web chat, or send us an email. Don’t forget to check the live price of silver on our website throughout the day!